If you love festivals then you’ll love this Magnakata Tipi wedding! Tracey and Roisin got married at the rustic Dunamoy cottages, Northern Ireland, last summer. It was a crazy, love filled festival wedding, with homemade dream catchers hanging from the ceiling and epic partying. The couple met at a fundraising flashmob in central station Belfast and have been together for 5 years. They are two of the most incredible human beings we have ever met and getting to capture their special day was most definitely a highlight of our wedding photography careers. I love getting to document a couple's most special day, getting to document and be a part of a friend's wedding is possibly one of the most rewarding things I have done. When Tracey and Roisin asked Mr Beardy and I if we would document their elven, boho tipi wedding we couldn't have said yes faster or louder! I have known Tracey and Roisin for quite a long time. I knew Roisin from working in bars back when I was 18 and I met Tracey while we started our journey together playing Roller Derby! All three of us also have a mutual friend, "Dude", "Hammer" or Fionn as some of us know her, who managed to make it all the way from Austraila to see these two tie the knot! Tracey and Roisin wanted a super chilled day, I was on strict instructions to just document the day as it happened with absolutely no posed photos! This was music to my ears, I love getting to just melt into the crowd and capture all the little and big moments that happen. This wedding is full of so many gorgeous thought out personalised touches... from the handmade dream catchers ( that they gave away to guests as flavours ) to the super romantic lantern send off, this wedding is a firm favourite of mine! Mr Beardy even got involved and made a gorgeous rustic/geometric wedding card box and as always did an amazing job of 2nd shooting! Tracey and Roisin got ready onsite in the cottages with their besties and parents. There was such an exciting vibe and a few nerves as they got ready. Tracey wore a beautiful boho babe dress from Free People, and Roisin wore an epic backless elven outfit from Elven Forest – they looked so gorgeous. The couple then walked the short distance to get to the ceremony. The girls chose to walk in separately with their parents as the guests lined the edges of the Tipi. The ceremony took place in the venue grounds in the incredible Tipi by Magnakata. The ceremony area was lit by fairy lights, candles and incense, which was perfect for the surroundings because it was an intimate alternative wedding. The ceremony began with the couple saying personal vows they’d written themselves, and finished with a big cheer from everyone. It was a wonderful ceremony, full of excited hand squeezes and so much love. I don't think there was a dry eye in the house….including ourselves. After the ceremony, the couple mingled with their guests, which was the perfect time for us to get candid photos. Then the girls decided to head indoors as Roisin had written a letter for Tracey, which was perfect for the girls to get some time on their own and let the festivities sink in. I got some stunning candid photos as they enjoyed the afternoon – the vibe was electric and everyone was having a blast. The weather was all sunshine and blue skies, it was a stunning day. 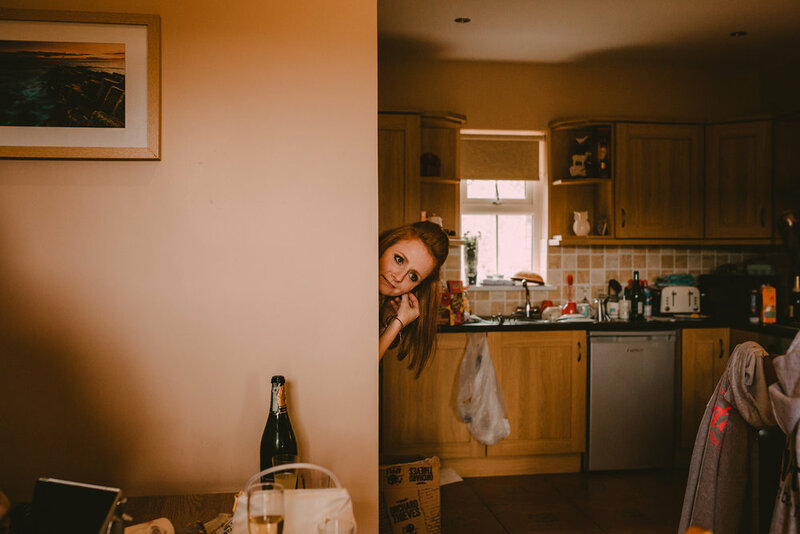 Tracey and Roisin chose to have their wedding at Dunamoy cottages because they could have the place for the whole weekend, they could decorate it as they wanted and it has so many options. This was the first wedding at Dunamoy cottages and it’s got such a gorgeous atmosphere, especially outdoors where the the Tipi had been situated. For the reception, the couple had organised A bar and chill out areas for their guests, and everyone loved it . The girls had chosen to step away from a lot of traditions so there were none of the traditional expectations and the evening was so chilled and informal. Challis were in charge of catering and quickly brought out huge sharing platters which made for a very relaxed atmosphere and was the most amazing South African cuisine we have ever experienced. It was absolutely delicious. After the meal was finished, the girls decided to forego tradition and instead of cutting a cake or having a first dance they decided to have a lantern send off with their guests as the sun set. This was such a lovely thing to do with guests and made for a really special shared moment. The evening ended with epic shapes being thrown around the central fire pit, which was so much fun – pretty sure we threw some shapes of our own. The whole wedding was so chilled, from the beautiful vows to toasting marshmallows on the fire. 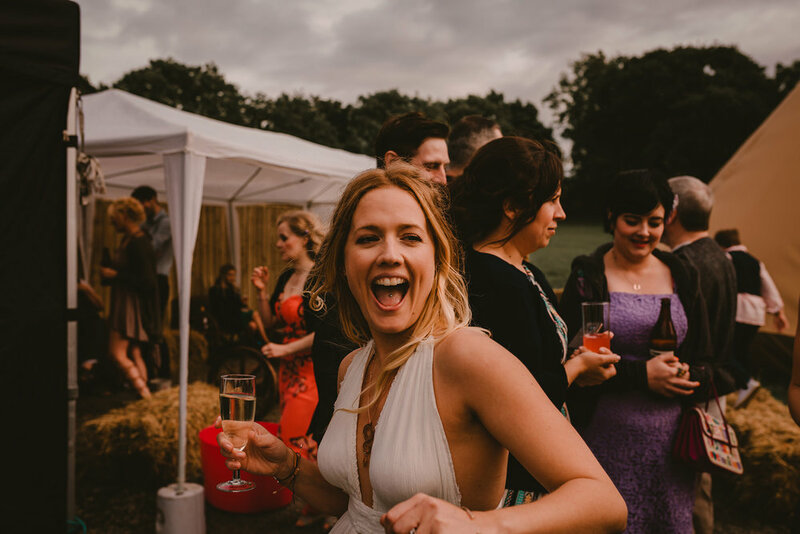 One of the best parts of the wedding was the chilled out atmosphere because everyone let their hair down and just celebrated the incredible day. The decor was also a talking point of the wedding – as everyone was able to take a handmade dream catcher home with them as a memento. We loved this chilled out tipi wedding so much. If you’re getting married and looking for alternative and natural wedding photographers, get in touch! Check out their highlight reel below and some of our favourite images from the day!